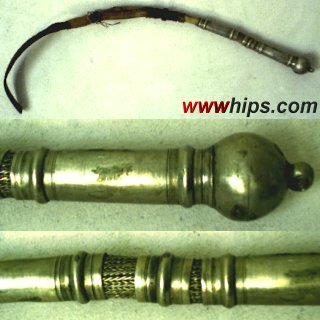 This whip must have belonged to a wealthy Arabian merchant of the 19th century. Unfortunately, the whip´s body is damaged due to its age of (estimated) 150 years. The body consists of cane with a layer of rawhide around it, covered with a finely braided rawhide "twine" overlay. The silver handle consists of three pieces (to keep the whip more flexible), joined with silver wire mesh.The slapper is made of some thick leather. As the overlay has almost gone except two areas, the whole whip got out of shape and cannot be repaired.